When Bob Bernstein, as CEO of Random House, went to Moscow in 1976, he had a chance to meet some of the dissidents whose freedom of speech he had championed for years through his publishing and human rights work. He sat at Andrei Sakharovs kitchen table for several hours one night, and marveled at the personal sacrifices that the Soviet Unions most prominent scientist was willing to make in order to press his own government to change. From that night on, Bob began doing human rights work, seeing the movement as an endangered group of courageous individuals speaking out for the rights of all, who had to be vigorously defended, one person at a time, when they suffered the inevitable consequences. In all of his activities, Bob maintains a firm set of principles and an optimistic belief that each individual can make the world a better place. 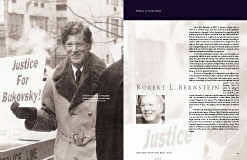 Two years after his evening with Sakharov, he, Orville Schell, Aryeh Neier and Jeri Laber established Helsinki Watch, the first piece of what became, over time, Human Rights Watch. Since then, he has charmed, badgered, harassed, impressed and enlisted others into the cause. Both his friends and his adversaries learned a long time ago that giving up does not appear in his lexicon. The focus on the people who make up the human rights movement remains Bobs trademark after more than twenty years of leadership. In 1994, after the Soviet Union had broken up, he went to Beijing to meet Wei Jing Sheng, Chinas most famous dissident. Wei had served more than fourteen years in prison for calling for democracy in China, and was given a few months of freedom in response to global pressure on his behalf. When Wei was rearrested and sentenced to another fifteen years, Bob worked tirelessly for his release. When Beijing finally gave in to the worldwide campaign and sent Wei into exile in November of 1997, he spent his first American Thanksgiving with the Bernsteins in Bedford, N.Y.
Bob Bernstein thinks big and always has. Twenty years ago, when he founded the first piece of Human Rights Watch, he predicted that the small group around the conference table at Random House would one day expand to cover the world. The fact that we do so today is largely because of him. In the past two decades, he has dedicated thousands of hours of his time and creative energy, even when the obstacles appeared insurmountable or the tasks too large. What Sakharov and Wei have shown in their lives, Bob Bernstein has demonstrated in his: the power of an individual, willing to be bold and committed. 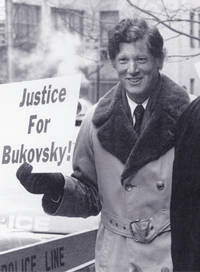 Bob Bernstein demonstrates on behalf of jailed writer Vladimir Bukovsky, on the sidewalk outside the Soviet Consulate in New York, 1978.